Plenty continues to take shape! Plenty, our culinary and nutritional program, has been serving our community of partners since 2014. 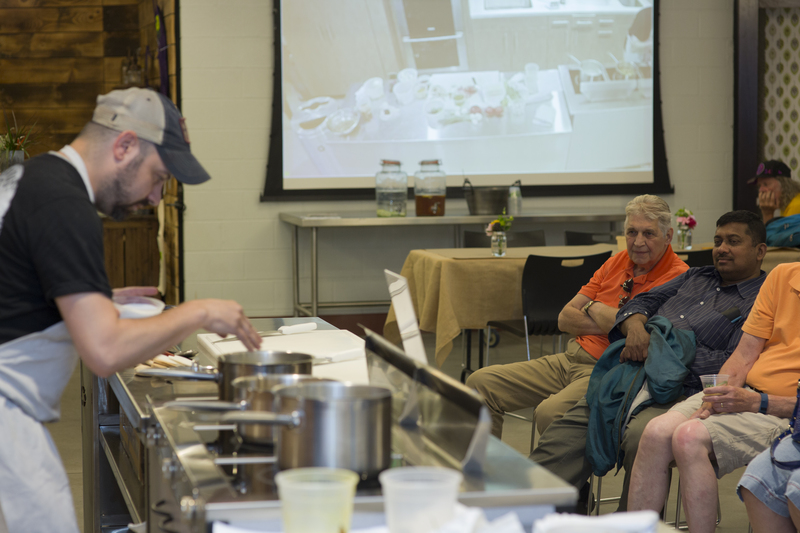 Through cooking demonstrations led by our chef partners, we teach our beneficiaries whole-ingredient, low-waste cooking using the delicious food we distribute each day to more than 25,000 people in Greater Boston and MetroWest. Last week, Plenty was on the main stage at Boston Public Market, where chef Louis DiBiccari gave demonstrations on mushroom stem rice pilaf, spring onion top salsa, and potato and cauliflower stem soup. It was our first foray into the public setting with Plenty, and chef DiBiccari got rave reviews! This week we’ve also started producing and filming a series of Plenty videos at BCAE to share with even more people the importance of nutritional, low-waste cooking! We will be filming the best of our workshops with our chef partners this summer, and can’t wait to share them with you! Here’s a look at Boston’s own Tiffani Faison, who led a workshop on no-stove cooking in March! In the video, we hear from the wonderful community at ABCD (one of our partners) about the value of Plenty workshops (and Meg makes a cameo, too!). Please watch the video, produced by ABCD, and share and enjoy! Happy cooking!